Importers & Dealers of Hand Tools of PROTO, FACOM, RIDGID, SNAP-ON, WIHA make. Torque Tools of GEDORE, TOHNICHI, NORBAR make. ENDRES & EGAMASTER Non-Sparking Tools, MITUTOYO, STARRET, DIGIPAS, LASERLINER Measuring Instruments, Lifting Tackles of CROSBY, GUNNEBO, RUD, CAMLOK make. Hydraulic Fittings & Accessories of PARKER, SWAGELOK, BAND-IT, DIXON. GEORG FISHER UPVC Valves & Fittings, OMB Italy High Pressure Ball Valves, SECURELIFT Polyester Lifting Slings, MOLYKOTE Industrial Greases & Lubricants, BOSNY Aerosol Touch-up Spray paints and DUPLICOLOR Zinc Galvanizing Spray Paint. Oil and Gas, Marine, Shipping, Automotive, Heavy Engg, Wind Turbine, Power Generation, Construction. With the expertise of our research and development wing we are enabled to manufacture sophisticated engineering components such as pipe fitting, automotive spray paint, industrial tools, etc. Therefore our research and development unit is a fundamental part of our organization. The unit is equipped with all the required amenities to successfully perform research work of the current market development and clients’ requirements. Our expert research and development personnel conduct scrupulous market studies and they suggest innovative measure to improvise the quality of our components and upgrade our production methodologies. 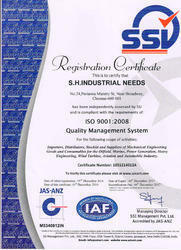 Due to their painstaking effort we cater our services to all the relevant industries. Our components are manufactured with premium raw materials which standardizes our components. The industrial hardware and mechanical consumables are required for production and maintenance of machineries, construction and heavy engineering. We also serve as service providers to various industries. We also offer customized solution for Rubber, Plastic, Metal and fabrication works are done. The after sales services that we provide to our clients add value to our credibility as we can further assist them in handling our components. Our sky scrapping growth and success is due to our efficacious workforce. Team is an inherent fraction of our organization and they heighten their competence on execution of their individual responsibilities with absolute obligation and accomplishment. We have expert quality analysts who ensure that we fabricate high grade components by using qualitative raw material. Our proficient engineers work on technical innovation which suits current industrial requirement. The marketing executives are steady investigators working on different market strategies. With the help of their in-depth knowledge, we have been able to successfully source and supply our components as well as setting our widely insisted market value.